If you want to create a look of luxury and elegance in your wedding ceremony or reception tent, consider fabric tent draping. Fabric leg skirts can be used on both Frame tents and Pole tents, with or without a ceiling liner. These sections of draped fabric cover the legs around the perimeter of the tent. Leg skirts soften the look of the tent and help create an intimate atmosphere for dinner and dancing during your reception. 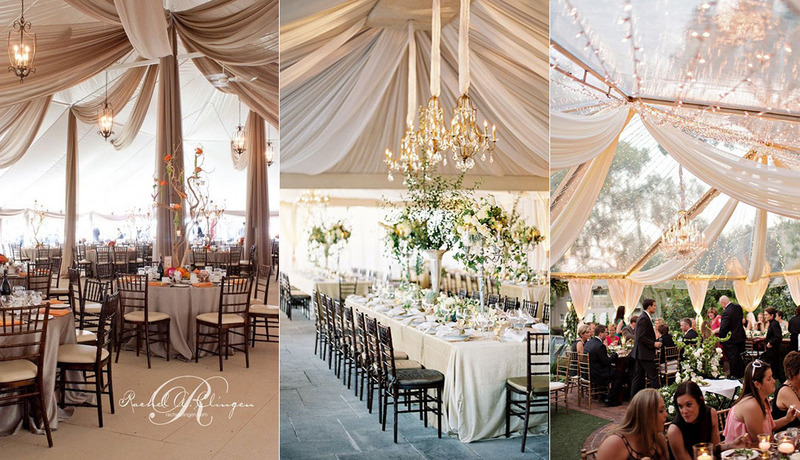 Keep reading to learn about the wedding tent draping options available and to find inspiration for your wedding. Publisher is a wedding blog for the stylish brides. © 2019 - Roses & Rings | Weddings, Fashion, Lifestyle + DIY. All Rights Reserved.